This is the best homemade ring bologna recipe from scratch. To make things even tastier, I have posted my pork sausage recipe below. Now you need to make the homemade pork sausage and use that in the ring bologna. Divine flavor. This ground venison recipe makes 2 pounds of ringed bologna. You can use your own pork sausage or Jimmy Dean ground pork sausage in bags. Leave out the Liquid Smoke and make it with maple breakfast bulk sausage for a sweet taste. You may also use beef hamburger instead of the ground venison. Mix all of the ingredients together in a large mixing bowl. Cover with the water and place in the refrigerator for 24 hours. It may look brown but that's okay. PREHEAT oven to 350 degrees. Place a wire rack inside a cookie sheet so the fat drips away from the meat. Form meat into two logs and bake for 60 to 70 minutes; do not cover. Remove from oven and cool. 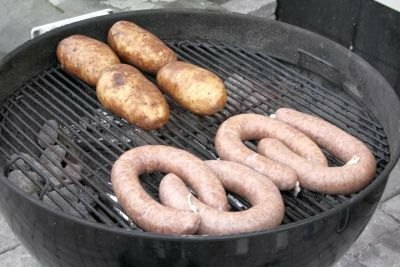 Instead of forming the meat into round logs, just fill sausage casings and bake as directed. I love this with boiled potatoes and corn. It's just something I grew up with and love. A loaf of homemade bread makes and fresh salad with homemade salad dressing tops this meal off. Use this sausage in the ring bologna recipe for outstanding flavor. Thoroughly chill meat and fat. Using a 1/2 inch cutting blade, run the pork and pork fat separately through the meat grinder and chill again. Combine all seasonings. Mix the seasonings into the chilled meat and then put through the grinder with a 1/8 inch cutting plate. Mix meat and fat in a bowl and add just enough water to make a soft "dough." Freeze in bulk or make sausage patties. You may also stuff into casings and be sure to avoid air bubbles.